Now after I have lost my vision and I have been given the opportunities to get back into sports, my dream of being able to make the Olympic team has been restored. Only now I will have the chance to compete at the Paralympics; where I will be able to compete against other visually impaired athletes instead of fully sighted athletes as I did when I was younger and going through the process of losing my vision. Although playing sports with other kids taught me a lot of skills that transferred off of the field or the race course; the ability to express myself through competition is empowering. Para-sports have given me the avenue to be a great athlete as long as I put in the hard work, determination and make the necessary sacrifices to reach this goal. Some people may say that being able to compete as a visually impaired athlete has made us into “inspirational” people. To me it has just leveled the playing field and allowed us to compete for our country at a high level again. I like to view myself as the athlete first; I don’t really see myself as an inspiration. Although, if my competing or training helps to get more visually impaired people off of their couches and out doing something that they love, well, then that’s great to me. Para-sports has been such a second chance to compete that I would like to see more and more people being able to participate as well; whether if it’s at a recreational level or at a high performance level. What matters is the having the opportunity provided; what you do with it after is up to you. 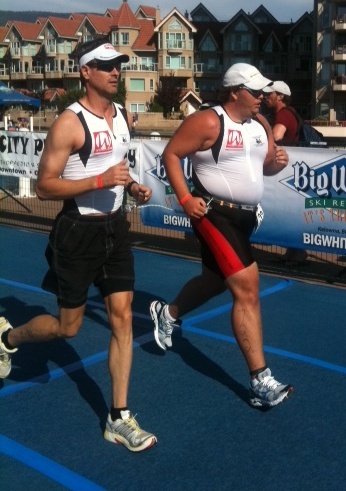 This entry was posted in Sports and tagged blind, empowerment, equality, para-sports, paratriathlon. Bookmark the permalink. Way to go Dave!!! So proud of you.